For starters, it just all looks damn cool. Say what you will about the exterior styling of the second generation Acura NSX, but what can’t be denied is its brilliant aerodynamics. This thing was designed to go fast with the least amount of interference from the wind as possible. To prove this, Engineering Explained teamed up with Acura - and with a little help from smoke grenades and paint. Here’s how what Acura calls “Total Airflow Management” basically works: First, there’s cooling, consisting of air flowing directly through the car, as well as 10 heat exchangers. Next, thanks to a flat underbody and rear diffuser, downforce is dramatically improved. Lastly, drag is manipulated thanks to an aerodynamic body. This is best demonstrated with flow-visualization paint, the same stuff used in Formula 1 to also test aerodynamics. And then there are smoke grenades which, aside from looking cool, clearly show just how brilliantly the NSX slices through wind. 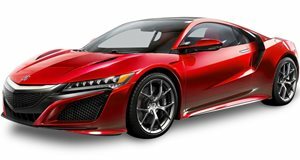 What we found to be particularly interesting is that most of the NSX’s downforce is created on the rear decklid. In fact, 75 percent of downforce is in the rear while the remaining 25 percent is up front. But we’ll let Jason explain because, well, it’s what he does best.